This tutorial contains detailed instructions on how to lock your entire computer contents on Windows 10 Pro or Enterprise Editions, by using the BitLocker encryption program. By enabling the BitLocker encryption on your computer, you will protect your sensitive data from unauthorized access, in case your computer becomes stolen or lost. How to encrypt your Windows PC with BitLocker (Windows 10 Pro & Enterprise). 2. 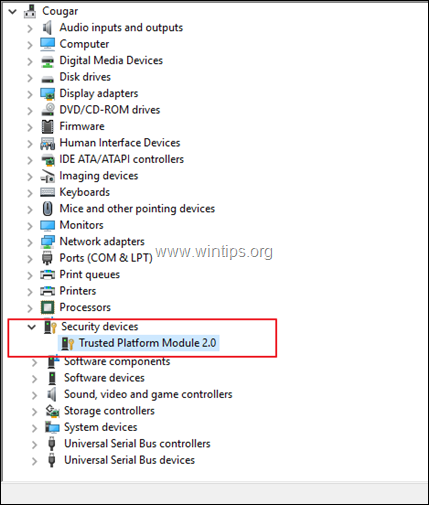 To enhance the BitLocker protection your device must own a Trusted Platform Module (TPM)** 1.2 or higher and Trusted Computing Group (TCG)-compliant BIOS or UEFI. If your device doesn't have a TPM module then you can buy one (if your motherboard supports it) or you can use BitLocker without TPM by disabling the TPM requirement in Group Policy (see Step-2 for instructions). 2. The TPM is a hardware component, commonly installed on modern devices (computers, laptops, etc.) and provides hardware based security through integrated cryptographic keys. In fact, a TPM chip is a crypto-processor which is designed to carry out cryptographic operations and includes multiple physical security mechanisms in order to make it tamper resistant and even a malicious software is unable to tamper with the security functions of the TPM. 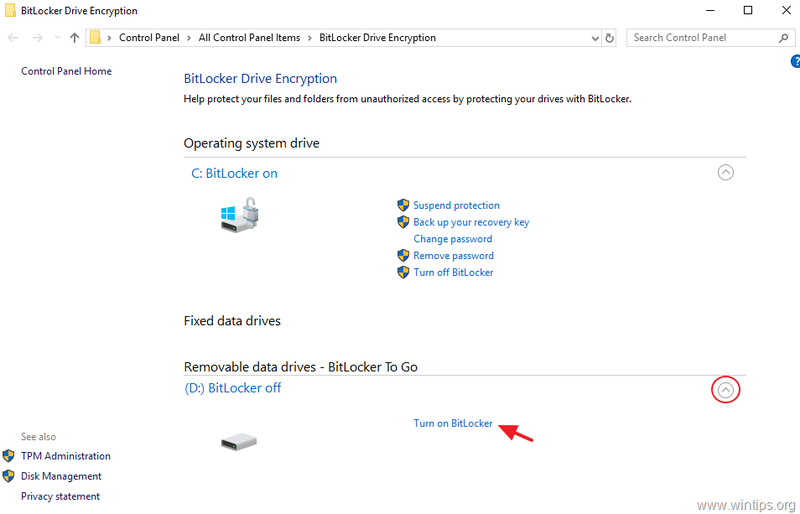 How to Setup BitLocker Encryption on Windows 10. Step 1. Check if your computer has a TPM chip. 3. If your computer has a TPM chip, then you should see under Security Devices, a Trusted Platform Module device with it's version number. 4. If you computer contains a TPM chip, then continue to step-3, otherwise continue to step-2 below. Step 2. 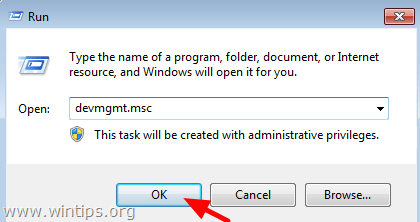 Disable the TPM requirement through Group Policy Editor. If you computer doesn't contain a TMP chip, then disable the TPM authentication for BitLocker. 4. At the right pane, double click at Require additional authentication at startup. 5. Choose Enabled, then check the Allow BitLocker without a compatible TPM (requires a password or a startup key on a USB flash drive) option and then click OK.
6. Close Group Policy Editor and continue to the next step. 1. 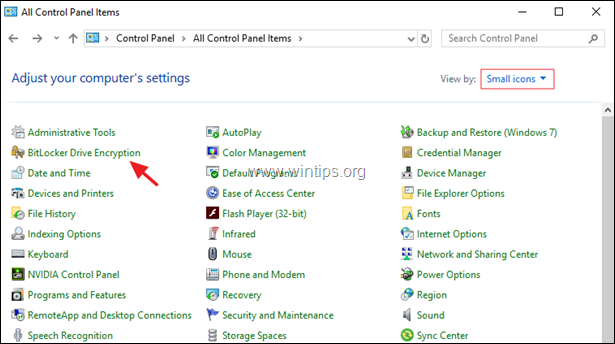 Navigate to Windows Control Panel (small icons) and open BitLocker Drive Encryption. 3. Press Next at the first three (3) screens. Insert a USB drive: If you want to unlock your computer by using a USB flash drive then plug an empty USB drive on your PC and select this option to continue. Enter a password: Click this option if you want to unlock your PC, by typing a password (like in this example). 5. Now type a strong password and click Next. Save to a USB flash drive. 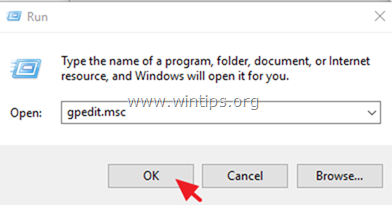 If you select this option plug an empty USB drive on the PC and follow the instructions to create the BitLocker recovery drive. If you having problems unlocking the computer (in the future), then plug the USB flash drive in to your locked PC and follow the instructions to unlock it. Save to a file: If you want to save the recovery key to a file, then plug a USB drive on the PC and then save the recovery key on the USB. If you can't unlock your PC in the future, then read the saved text file from another computer in order to find out the recovery key to unlock your computer. Print the recovery key and save the printed document to a safe place. 7. Now, according your case, select one of the following encryption options and click Next. 8. Then select the encryption mode according your needs and click Next. 9. Leave the Run BitLocker system check option checked and click Continue. 10. Finally restart your PC to run the BitLocker system check. * Note: If you forget the password then press ESC to access the BitLocker recovery options. 1. The encryption time varies according the encryption method you selected before and the size of the hard drive. 2. You can work at your computer during the encryption process. 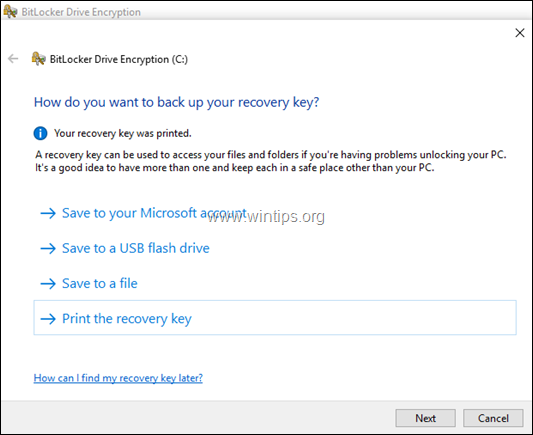 Available Options in BitLocker Drive Encryption program. Suspend Protection: Use this option if you want to pause the protection on your system in cases that you want to upgrade Windows 10 or to change the hardware on your PC. Remove Password: Use this option if you want to use another method to unlock your PC. (e.g. instead of using a password, you want to use a flash drive). 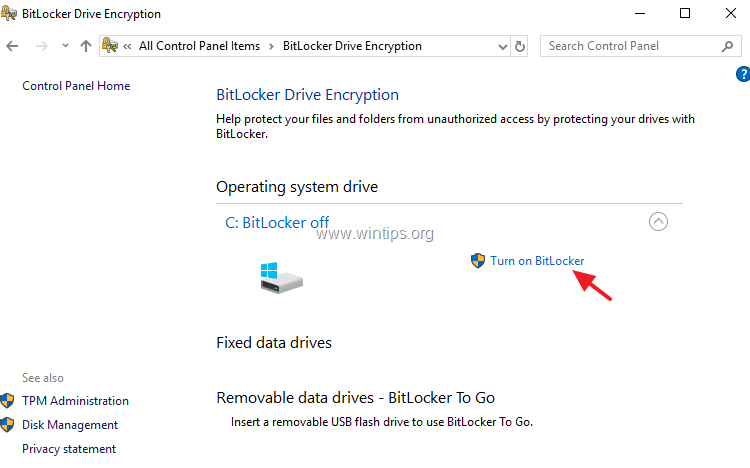 Turn Off Blocker Protection: By selecting this option, you will remove the BitLocker protections (encryption). Additionally from BitLocker's menu, you can turn on the encryption for any other fixed drive on your PC or you can use the BitLocker to Go option to encrypt any Removable Drive (e.g. you USB flash Disk). « How to Setup a VPN Connection on Windows 10. » FIX: Dell Laptop Needs the Bitlocker Recovery key (Solved).